One of HTC's latest Android powered smartphones is spreading quickly like a wild fire that's blazing out of the control. 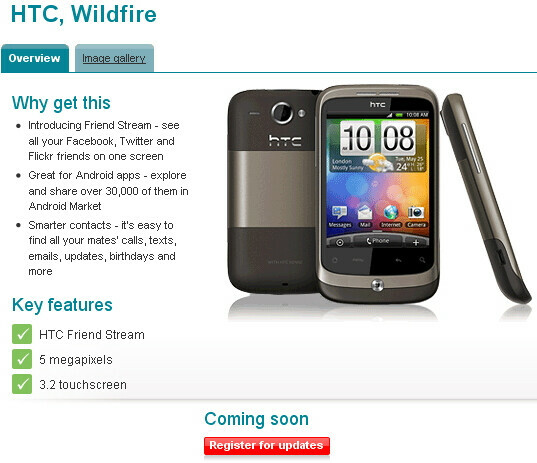 Previously, we reported that both T-Mobile UK and Virgin Mobile UK were going to be some of the carrier partners that would bring along the HTC Wildfire to their lineup. Now you can add Vodafone UK to the list as they'll begin to start offering the handset some time next month with a potential launch for France as well. Currently Vodafone owns the relatively affordable HTC Legend for free on plans starting at £20 per month, so one could expect the HTC Wildfire to be even available for free on cheaper monthly plans – allowing just about anyone to experience Android and all of its glory. If you're intent on checking out this device when it launches with Vodafone UK, you may want to sign up for email updates to get you the latest scoop surrounding it.